The Haibike XDURO All Mtn 7.0 is everything we love in an eMTB - a reliable motor and battery, and plenty of travel with modern angles. 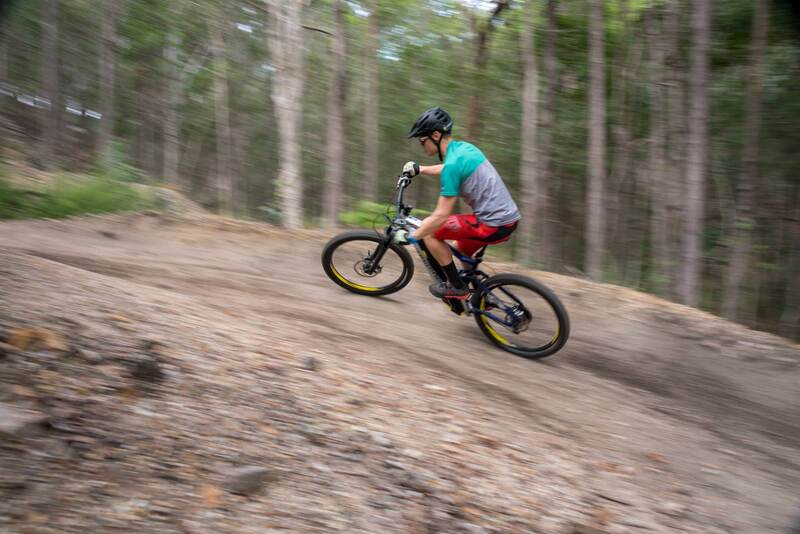 Though still quite new in Australia, German company Haibike have been around for well over 20 years developing and perfecting their eMTBs for the past 8. Whilst most think that these bikes just sprung on the scene in the last couple of years it is companies like these that have pioneered these technologies to get us to where we are today. What's it like to ride an eMTB? The Xduro All MTN 7.0 is a burly all-mountain bike that is ready to go and hit some pretty serious terrain. The oversized aluminium hydro-formed tubing protects the battery which is hidden within the downtube. The paintwork and decals are unashamedly Euro, the bold graphics leaving no doubt as to what brand the bike is. The blue and grey colour way with yellow highlights works well together and grew on me throughout the test. Sporting 150mm of travel front and rear with plus size tyres this is big bike. Thinking back to other bikes of this size I have tested the addition of pedal assist sounds like a pretty good idea to me. Why shuttle when you can ride up? Coming in at a cool $8995 this does put it at the higher end of the spectrum when compared to other eMTBs on the market. This does get you a reliable level of parts, especially on the suspension side of things which is a pretty major consideration with the additional weight and forces being generated by the bike. The RockShox Yari RC have 35mm stanchions to stiffen up the steering and Deluxe R out back rounds out the package. TRP G-spec Slates T4 are 4-pot brakes developed in conjunction with Aaron Gwinn to give ultimate braking power with 203/180mm rotors. This is a bike that is made to go fast. Which means you need the brakes to reel it in as well. 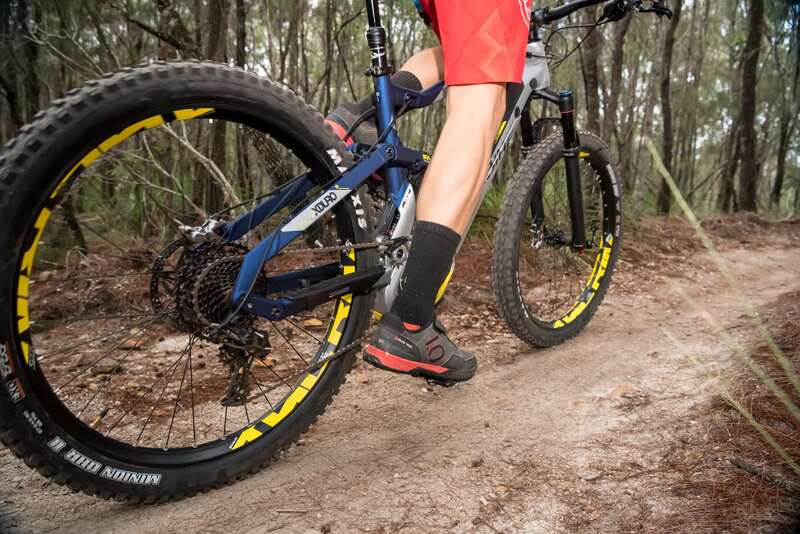 Wheels are 27.5+ rolling out on the tried and true Maxxis Minions. They are an In-house wheelset with Boost spacing on DT spokes, and a sweet 40mm wide rim. Lots has been written about the technology behind the battery/motor system. 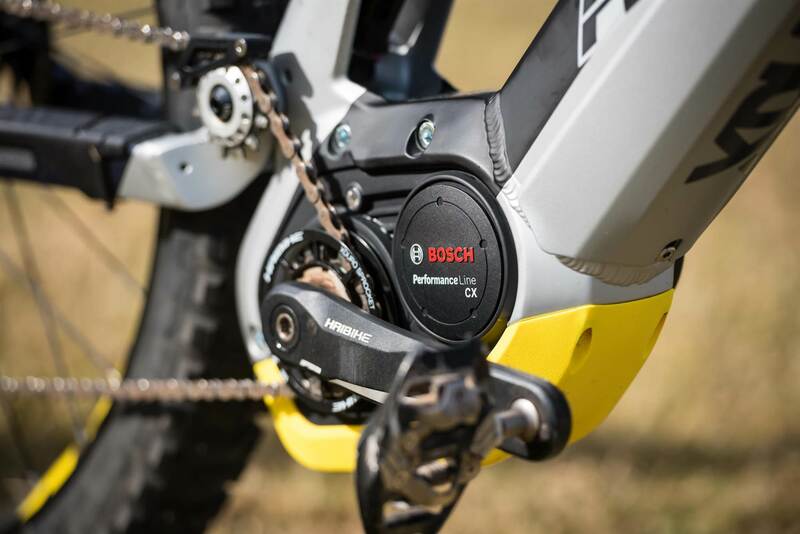 Suffice to say that Bosch is one of the leaders in the industry providing systems for many of the major bike companies. 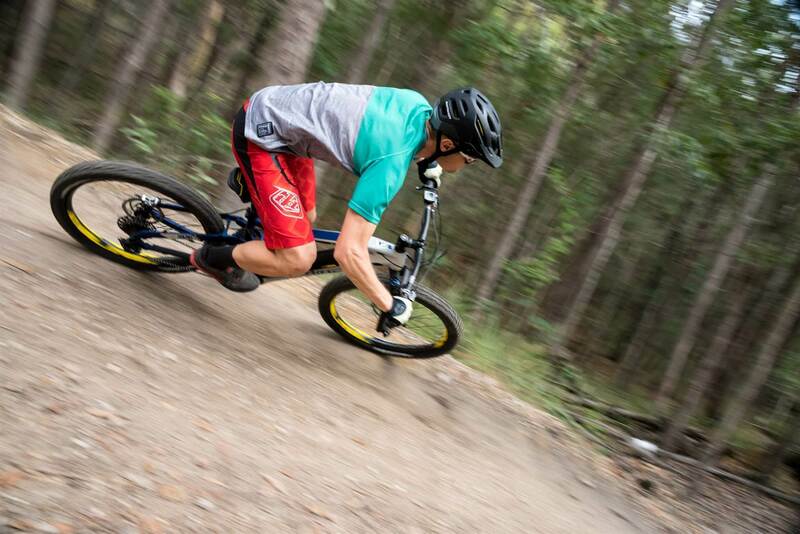 One of the big stretches for eMTBs has been how to give it a more natural feeling, with many complaining of a jerky feeling when putting the foot down that feels a bit uncontrollable when in tighter trails and you are trying to thread the needle. 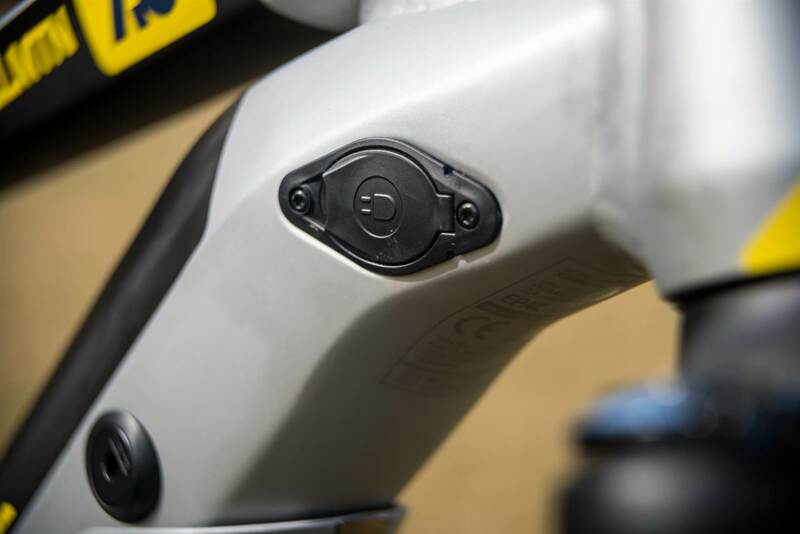 Bosch introduced the E-MTB setting about 12 months ago, and this adds a mid power option with modulation that has been lacking in previous iterations. Early reports from testing are dubbing it “Goldie Locks” setting. If you pedal harder, it gives you more assistance. When you soft pedal, it backs off. It is also said to be the most efficient use of battery life as well. With so much hype around the these upgrades it is going to be an interesting test. The arrival of this bike was quite serendipitous. Coming off a knee injury that has had me sidelined off the bike for a few weeks now the Haibike was a present from above. A chance to blast around on the trails and have some fun while not blowing up my knee in the process. Starting out with some easy trails to test the water the old knee ache wasn’t anywhere to be felt. That was as much of a green light as I needed, let the testing begin! On the trails the 25kg of bike is surprisingly nimble especially when you keep your cadence high. Having not spent any significant time on an eMTB prior to this test it took a good few rides to get my head into the game to figure out the strengths and limitations of the Haibike. Keep those legs turning and the Haibike rewards with good, even power. Smooth pedal strokes out of a corner are rewarded with a boost that pops you about in a playful manner. Using all the power settings, the E-MTB setting felt spot on in tighter trails where turns come in quite quick succession needing a few pedal strokes to keep the flow going. Trying the same in the TURBO setting whilst doable does feel like you are trying to tame a wild bronco. When the trail opens out the E-MTB really shines, the more pressure you push through the pedals the more the bike obliges. Chasing your mates down on the trail you become like a dog chasing down a rabbit. Finally I could hit out with our XC whippet editor. I could hold his pace and even give him a taste of his own medicine. The best bit of it was that we both got full value from the ride. 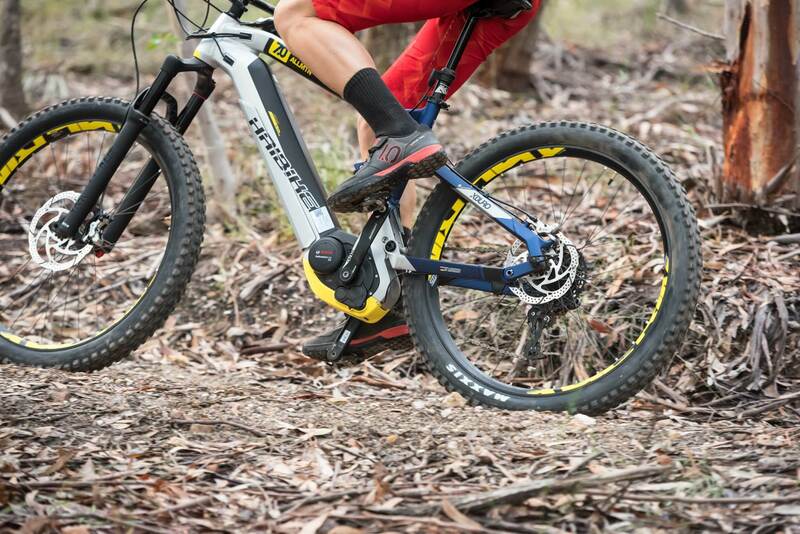 Like any eMTB sold it's limited to about 25kmh, so assistance cuts out beyond that speed. But on an uphill and on trails that is plenty fast and when heading down – you don't need it anyway. E-TOUR felt like the lowest fun setting on the bike, that is I can live with it to extend a ride to link up more good trail without feeling like I am dragging the chain a little bit. ECO I consider in mountain bike terms to be a back up plan if you totally miscalculate the length of your ride with only a slight advantage to what would just be riding a really heavy bike. 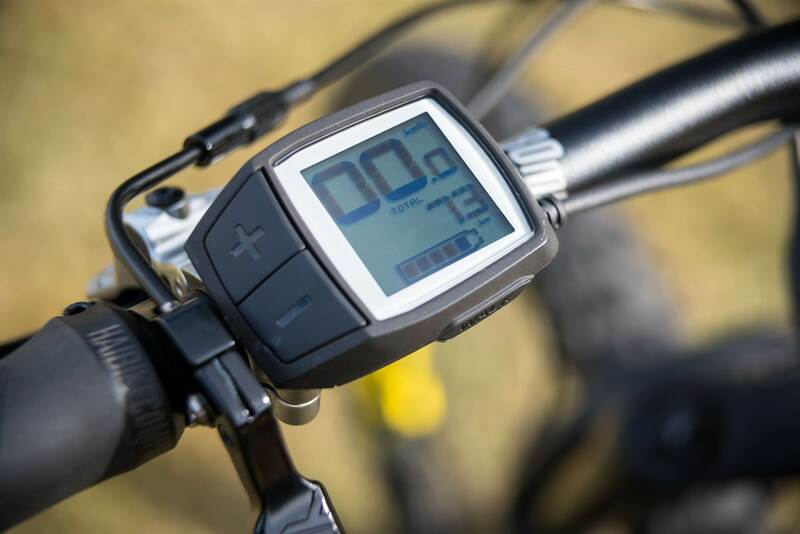 Obviously all the settings drain the battery at different rates and there is a battery life tool available on the Bosch website to see how much the different settings impact battery life as well as factors like cadence, speed etc. This is worth a play for those who like to geek out a bit. The onboard computer does give you an idea of range, and how far you have ridden, and of course battery life. It's worth being mindful of your settings if you plan a big day on the trails. Charging is as simple as plugging the bike into the wall. The LCD display giving an indication of state of charging. Power aside the Haibike is the full and considered package. 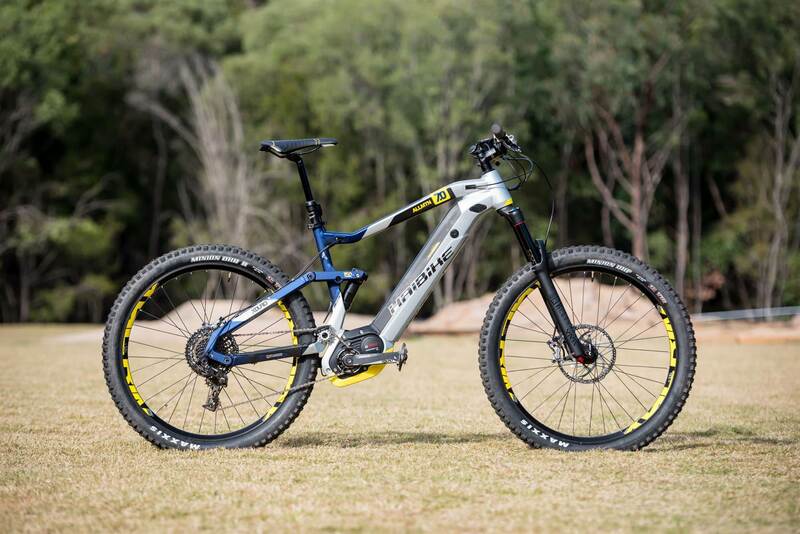 Frame design and higher motor position has allowed extra ground clearance and also shortens the chainstays to 465mm. Low bottom bracket clearance and overly long stays can plague other eMTBs on the market. All angles mirror that of a performance performance trail bike, the head angle comes in at a respectable 67 degrees. The solid suspension really exhibits how capable this bike is. The RockShox Yari with 35mm stanchions were stiff enough to push into corners with confidence that even 25kg of bike couldn’t shake. Coupled with the Deluxe R out the back the suspension felt balanced and ramped up flawlessly, the Motion Control dampening was on point, with all the travel on offer was used up but not once was there a harsh bottom out. More than once I found myself coming into sections overcooked, a result of the faster acceleration and inertia that a large bike generates. The TRP brakes performed solidly throughout the test saving my bacon on almost all occasions, sometimes things just go really pear shaped. The 4 pot design coupled with the large rotors were super consistent and no brake fade was encountered even on long steep firetrail descents. I was very impressed with these brakes. The XLC dropper post worked a treat with a simple design and light lever action. Sram NX 11 speed gave plenty of range and the shifting was solid. It is a mid-level group set but the shifts were consistent and it never missed a beat As expected the Maxxis tyres proved why the are so popular providing predictable traction and the sidewalls were burly enough to run tubes for the entire test without a single flat. Switch to tubeless for even more benefit. This is a bike that can be a lot of things to a lot of people. The setup is such that advanced riders will feel a portal to another facet of riding. It is like another skill to learn and perfect. To rip through undulating singletrack efficiently takes time to figure the strengths and limitations of the setup. 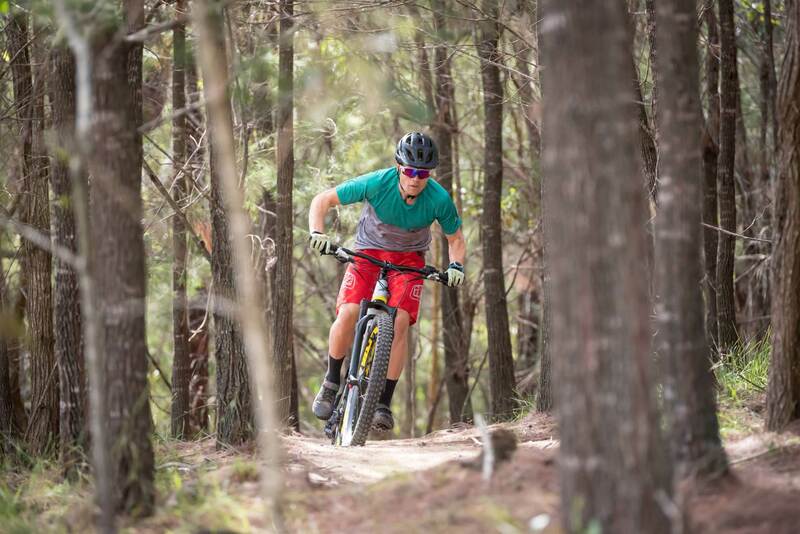 You will get more riding in, more kilometres and because of this your upper body gets a full on workout – you ride more trails and have a big bike to throw through the turns. 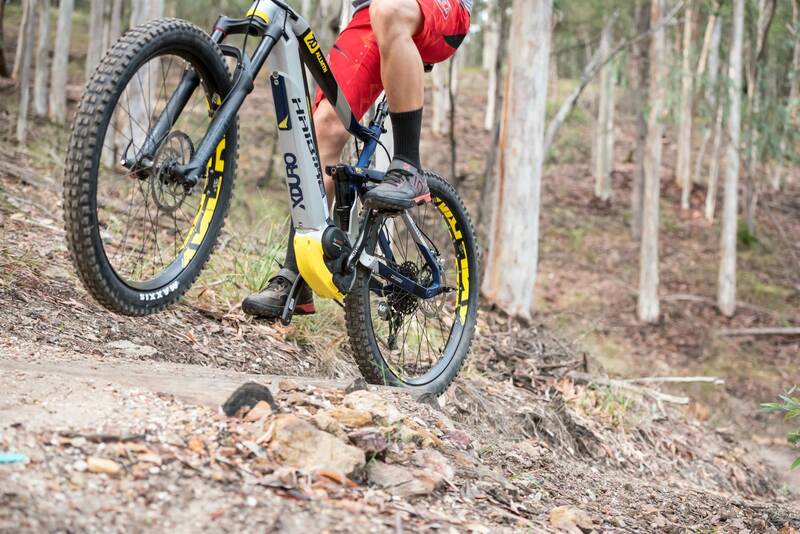 The Turbo setting in the singletrack is definitely something that needs a deft touch. The E-TOUR setting is perfect for those just starting out off-road the pedal assist giving even traction through looser terrain without the white knuckle moments that the higher settings can induce. It cannot be overstated that an eMTB does not make up a lack of technical ability, a beginner will not magically be able to flawlessly shred singletrack. The Haibike gives oodles of stability and confidence to riders learning to push their boundaries as they become more proficient. Need more details on the spec? 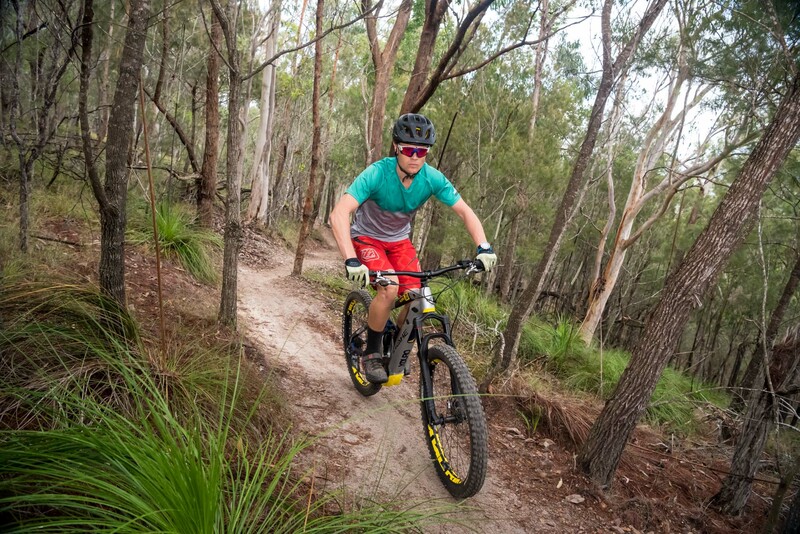 Head to the Haibike Australia website. Want to stay ahead with what we are up to? You should subscribe to AMB magazine.